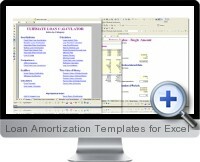 Loan Amortization Templates for Excel (Ultimate Loan Calculator) enable to make informed financial decisions on loans and lease arrangements. Loan Amortization Templates for Excel consists 29 preformatted Excel worksheets for instantly calculating payments and amortization schedules on mortgages, auto leases, student loans and other types of financing arrangements. The templates allow to build customized payment plans and add colorful charts to visually illustrate computations and amortization schedules. Comparisons based on monthly payments, taxes and interest amounts. Qualifiers to compare, evaluate and ensure loan affordability. Calculators for a variety of loan related dynamics (interest penalty, consolidation, benefits of extra payment and more). Time value of money calculations.